OK, it’s only the third day of the year, and we’ve already introduced TWO major new features (and two minor ones) to SlopeCharts! Not bad for a free product, is it? (And, although I can’t believe it, we’ve finished another major feature, which I’ll announce tomorrow). 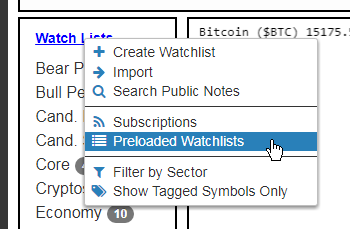 The latest is something I’ve been wanting to do a while: Preloaded Watchlists. 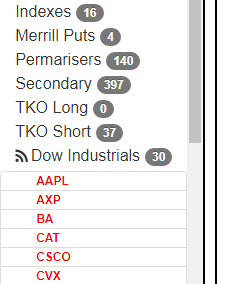 These are basically ready-to-use lists of common groupings (like the components of the S&P 100, the Dow Industrials, and so forth) which you can fetch with a mouse click. I’m planning to add plenty more lists, too, in order to save you – – yes, you – – time. PLUS users will recognize the dialog box that comes up next, since it resembles the Published Watchlists feature. You can see the lists, their descriptions, and Subscribe or Unsubscribe to any of them by choosing the corresponding dropdown. Once you subscribe to something, it will appear on your watch lists module. You can obviously scroll through the charts in these lists, but if you want to monkey around with them (add symbols, delete symbols, etc.) the best thing to do would be to COPY the symbols from a preloaded list into a new list of your own. Then you can have your way with it!